Visit the current edition of the School! Alfonso Araque is Professor in the Department of Neuroscience at the University of Minnesota since 2013. He obtained his Ph.D. in 1993 in Biological Sciences at Universidad Complutense de Madrid. He did his postdoctoral research with Dr Phil Haydon at the Iowa State University, Ames, USA, from 1996 to 1999, studying astrocyte-neuron communication in cultured cells. He established his independent laboratory in 2001 at the Cajal Institute in Madrid, Spain, where he continued to study the properties and mechanisms of the reciprocal communication between neurons and astrocytes. He was Coordinator of the Biomedicine area of the National Agency for Evaluation and Prospective in Spain, Vice-President of the Spanish Society for Neuroscience. He is editorial board member of Cell Calcium, Glia and eNeuro. His major contributions include: the first demonstration of astrocyte-induced slow inward currents (SIC) mediated by calcium and SNARE-protein dependent glutamate release from astrocytes; the ability of astrocytes to discriminate between the activity of different synapses and to integrate those inputs, which indicate that astrocytes show integrative properties for synaptic information processing; the existence of new forms of neuron-astrocyte signaling mediated by endocannabinoids; the ability of astrocytes to regulate synaptic transmitter release at single hippocampal synapses; the existence of a form of long-term potentiation (LTP) of synaptic transmission induced by the temporal coincidence of astrocytic and postsynaptic signalling; the ability of endocannabinoids to potentiate synaptic transmission through stimulation of astrocytes; the involvement of astrocytes in the cholinergic-induced LTP in vivo; and the circuit- and synapse-specific astrocyte-neuron signaling in the striatum. In my lab we are interested in signalling between neurons and glial cells (oligodendrocytes, astrocytes and microglia), and in how the brain’s energy supply is controlled and determines the computational power of the brain. Recent work on neural-glial signalling has focussed on how activation of glutamate and GABA receptors on oligodendrocytes may be responsible for the mental and physical disability occurring in white matter diseases such as cerebral palsy and spinal cord injury. Our studies of brain energy supply have characterized a new locus (in capillaries) for control of cerebral blood flow, have investigated how the amount of energy the brain receives determines the speed of the neural computations performed, and have studied the consequences of failure of the energy supply in conditions like stroke. We are also interested in how synaptic signalling to neurons is modulated. This work is performed using patch-clamp, calcium imaging and oxygen electrode techniques applied to brain slices and isolated cells, and using mathematical modelling. Dr Giorgio Carmignoto is group leader at the Institute of Neurosciences which belongs to the National Research Council (CNR), the main public research organisation in Italy. He is also associated with the Department of Biomedical Sciences of the University of Padua. The central theme of his research is the specific signalling between neurons and astrocytes investigated by laser-scanning microscope living cell imaging and patch-clamp recording techniques. Among obtained results are the first evidence for the ability of astrocytes i) to be activated by neurotransmitter synaptic release in slice preparations; ii) to work as principal mediators of neurovascular coupling; iii) to generate neuronal synchrony by acting on extrasynaptic NMDA receptors. His research is now focused on the role of astrocytes in epilepsy. Elly Hol was trained as a medical biologist with a specialization in molecular neurobiology. After her Ph.D. in Utrecht, she obtained a Max-Planck Fellowship to work for 2 years at the Max-Planck-Institute for Neurobiology in Martinsried, Germany. In 1997, she started as a post-doc at the Netherlands Institute for Brain Research in Amsterdam, where she acquired substantial funding, including a fellowship of the Netherlands Brain foundation. Between 2003 and 2013 she headed the group “Astrocyte Biology & Neurodegeneration” at the Netherlands Institute for Neuroscience. She currently is professor of “Biology of Glia and Neural Stem Cells” at the University of Amsterdam (2011), and associate professor in Utrecht (2013). Elly Hol is a recipient of numerous research grants, including the prestigious NWO VICI-award. She is in the editorial board of Glia, chair of the ‘Friends of the Neurofederation’, and chair of GliaNed. The research of her group is focused on the role of glial cells in brain diseases. The overall aim is to elucidate the molecular and functional changes in glia that contribute to the pathogenesis of neurological and psychiatric diseases. Her work is particularly concerned with studying glial cells in human post-mortem brain tissue and in mouse models for brain diseases. She applies sophisticated immunological, molecular and cell biological techniques on whole brain tissue and on glia isolated from human and mouse brains. Elly Hol’s work is published in leading journals such as Brain, Molecular Psychiatry, Science, and Stem Cells Translational Medicine. She is regularly invited as a speaker at dedicated research conferences and at events for a broader scientific audience. She enjoys to explain research to the general public. Frank Kirchhoff is Chair of the Department of Molecular Physiology at the University of Saarland in Homburg, Germany. He studied biochemistry at the University of Hannover, received his PhD degree in neurobiology from the University of Heidelberg and habilitated in biochemistry at the Free University of Berlin. After postdoctoral periods at the University of Heidelberg and the Max-Delbrück-Centrum for Molecular Medicine, Berlin, he started his research group ‘Glial Physiology and Imaging’ at the Max Planck Institute of Experimental Medicine, Department of Neurogenetics in Göttingen in 2000. In 2009, he was appointed as full professor at the University of Saarland. He is Editorial Board Member of GLIA and Journal of Chemical Neuroanatomy. His research addresses the molecular and cellular mechanisms of neuron-glia interactions using transgenic mouse models and in vivo-imaging. He developed a series of transgenic mice with cell-type specific fluorescent protein or inducible cre DNA recombinase expression in various glial cells. These mice appeared as valuable tools to study the structural dynamics of glial cells and the function of glial transmitter receptors in vivo. Dr. Giovanni Marsicano is a tenured researcher at Inserm. 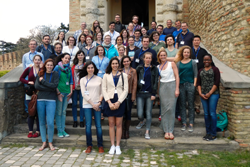 He leads the group “Endocannabinoids and Neuroadaptation” at the NeuroCentre Magendie, an INSERM and University of Bordeaux Research Center devoted to neuroscience. Dr. Marsicano is a Veterinary Medicine Doctor as formation. After the Veterinary diploma, he worked on research related to Embryonic Stem Cells from farm animals and to xenotransplantation models in Italy for 4 years. He then moved to the Max-Planck Institute of Psychiatry in Munich for a PhD student position, where he initiated the work on the role of type-1 cannabinoid receptors (CB1) and of the endocannabinoid system (ECS) in brain physiology, which since has been his main research interest. The subject of his PhD thesis was the generation of conditional mutants for CB1 and anatomical and functional studies on the mechanisms of action of the ECS. After PhD graduation in 2001, he made two post-doc periods in Germany and moved to Bordeaux in 2006 (recruited as senior scientist in 2007) to lead his independent research group. He is member of the SfN, the French Society of Neuroscience, the International Cannabinoid Research Society (ICRS) and of the International Society of Neurochemistry (ISN). By using conditional mutagenesis in mice and behavioral, biochemical and electrophysiological tools, his work contributed defining the role of CB1 in specific cell populations in learning and memory, food intake and energy balance, anxiety, stress-coping and others. Through a clear bottom-up scientific approach, these studies allowed exploring some general principles of brain functioning, such as the balance between excitation and inhibition, the interactions between the brain and the periphery, the importance of energy metabolism in brain functions and, more recently, the interaction glial-neurons. In 2012, by generating conditional mutant mice lacking CB1 receptors from GFAP-positive cells, he contributed to define the role of astroglial CB1 receptors in the working memory effects of cannabinoids and on their in vivo electrophysiological correlates. Since then, the role of astroglial CB1 receptors became one of the most important lines of research in his group. Dr. Keith Murai is a Professor of Neurology & Neurosurgery at McGill University and is the Director of the Centre for Research in Neuroscience and Leader of the Brain Repair and Integrative Neuroscience (BRaIN) Program at the Research Institute of the McGill University Health Centre. He is a recipient of a Canada Research Chair and is an EJLB Scholar. His research focuses on: (1) Understanding neuron-astrocyte communication in the developing and adult brain and its relationship to neurodevelopmental disorders and neurodegenerative diseases and (2) Discovering mechanisms regulating synaptic plasticity and memory formation in the healthy and diseased brain. His research uses cutting-edge mouse genetics with electrophysiological and imaging techniques. He is an Associate Editor at the Journal of Neuroscience, Editor at Frontiers in Cellular Neuroscience, and an editorial board member at Developmental Neurobiology. Eric A. Newman, a Distinguished McKnight University Professor of Neuroscience at the University of Minnesota, is an internationally recognized leader in the field of glial cell biology. He received his Bachelor’s and PhD degrees from the Massachusetts Institute of Technology, did postdoctoral work at the Schepens Eye Research Institute, and was appointed to the faculty of the University of Minnesota in 1990. Dr. Newman’s research focuses on glial cell functions and the regulation of blood flow in the central nervous system in health and disease. He has characterized signaling pathways mediating neurovascular coupling in the retina and has studied changes in neurovascular coupling associated with diabetic retinopathy and retinal ischemia. His findings have broad implications for brain function, suggesting that glial cells play an essential role in many key brain processes. Richard Robitaille is a Professor in the Département de neurosciences at Université de Montréal, Montréal, Canada. He is the director of the research group on the central nervous system (GRSNC) at Université de Montréal. He received his Ph.D. in 1989 in Neurobiology at Université Laval with Dr Jacques P. Tremblay. He did his post-doctoral training with Dr Milton P. Charlton in the Department of Physiology at the University of Toronto from 1989 to 1993. He then started his independent research activities in 1993 at Université de Montréal where he stayed since. He received number of national and international awards at all stages of his career. He is an associate editor for the journal Glia and Current Opinion in Physiology. His research focuses on the role of glial cells in the regulation of synaptic functions in normal as well as in pathological conditions. He uses mammalian neuromuscular junctions and acute brain slices as experimental models. He addresses the role of glial cells in the regulation of basal synaptic transmission and the regulation of synaptic plasticity. He also studies the contribution of glial cells in the outcome of synaptic competition, during aging and in ALS. A highly precise yet complex network of trillions of synapses are mapped onto specific regions of the brain to form neural circuits. Sensory experience (vision, touch, etc.) then regulates remodeling of these synapses throughout life such that less active synapses are removed and more active synapses are maintained. The goal of my lab’s research is to understand how resident immune cells of the brain, microglia, remodel synaptic connections in health and disease. This line of research builds off my original finding that microglia engulf and eliminate less active synapses in the developing visual system. These data challenged two universally accepted notions that synaptic remodeling was neuron-autonomous and microglia were primarily involved in disease and inspire exciting new questions: Do microglia remodel synapses throughout life? Do microglia remodel specific types of synapses? Are microglia necessary for functional neural circuits? What molecular mechanisms direct microglia to interact with synapses? To address these questions, we use a combination of powerful molecular genetic approaches, high and super-resolution static imaging, and 2-photon live imaging in behaving mice. Long term, we will apply our findings in basic neurobiology to elucidate underlying etiologies of neuropsychiatric disorders with underlying defects in brain wiring including autism and schizophrenia. Marie-Ève Tremblay is an assistant professor at Université Laval in Québec since March 2013. During her training, she developed expertise in non-invasive imaging to study the physiological roles of glial cells throughout the lifespan. Using these techniques, her postdoctoral work revealed that microglia, the resident immune cells of the brain, actively remodel neuronal circuits (by phagocytosis of pre-synaptic axon terminals and post-synaptic dendritic spines) during normal physiological conditions. As an independent investigator, she is now exploring the significance of this new cellular mechanism which could represent the missing link between neuroinflammation and cognitive dysfunction in the pathogenesis of diseases. In particular, her research focusses on elucidating the roles of microglia in the loss of synapses which best correlates with the impairment of learning and memory across chronic stress, aging, and various pathological conditions. In complement, she is investigating the involvement of bone marrow-derived myeloid cells which infiltrate the brain through the vasculature, to provide further insights into the relationship between the brain and body across homeostasis, plasticity and disease. She is also studying additional physiological roles of microglia and other myeloid cell types in the brain, as well as their dysregulation upon chronic stress, depression, schizophrenia, aging, and neurodegenerative diseases to identify new pathogenic mechanisms. This work is conducted using a longitudinal approach that combines non-invasive chronic two-photon in vivo imaging –structural and functional– with superesolution microscopy, correlative 3D-scanning electron microscopy, and behavioural assessments. Her long-term goal is to help develop new therapies using myeloid cells as vectors for effecting targeted changes in neuronal circuits, in order to spare memories, learning and other cognitive functions. Professor Alexei Verkhratsky, MD, PhD, D.Sc, Member of Academia Europaea (2003), Member of the German National Academy of Sciences Leopoldina (2013), Member of Real Academia Nacional de Farmacia of Spain (2012), member of The Dana Alliance for Brain Initiatives (2012), was born in 1961 in Stanislaw, Galicia, Western Ukraine. Between 1989 and 1999 he worked in Heidelberg, Gottingen, and in Berlin. He joined the Division of Neuroscience, School of Biological Sciences in Manchester in September 1999 and became a Professor of Neurophysiology in 2002. From 2007 to 2010 he was a visitor professor/Head of Department of Cellular and Molecular Neurophysiology at the Institute of Experimental Medicine, Academy of Sciences of Check Republic. Alexei also serves as a Research Professor of the Ikerbasque (Basque Research Council) in Bilbao, where, from 2012, he acts as Adjunct Scientific Director of the Achucarro Basque Center for Neuroscience; from 2011 he is as a Honorary Visitor Professor at Kyushu University, Fukuoka, Japan. In 2016 he was awarded Niels Bohr professorship in Glial Cell Biology at the University of Copenhagen. Alexei is the editor-in-chief of Cell Calcium, Deputy Editor of Cell Death & Disease and member of editorial boards of many journals. Alexei is an internationally recognised scholar in the field of cellular neurophysiology. He made important contributions to understanding the chemical and electrical transmission in reciprocal neuronal-glial communications and on the role of intracellular Ca2+ signals in the integrative processes in the nervous system. In recent years he studies glial ageing and gliopathology in age-related brain diseases, including Alzheimer disease as well as in neuropsychiatric diseases. He authored a pioneering hypothesis of astroglial atrophy as a general mechanism of cognitive brain disorders including neurodegenerative and psychiatric diseases. Scientometry: Prof Verkhratsky authored and edited 12 books and published ~ 370 papers and chapters. His papers were cited >15000 times, H-index 68 (ISI, 08/2016).